This collection of quotes, stories, poems, and essays from children with Asperger Syndrome, ages 2-17, offers us a glimpse into their daily lives, relationships, challenges, and victories, from their own perspective. In More Than Little Professors, parent and Asperger s specialist Lisa Barrett Mann, M.S.Ed., leads us through the children s works, explaining common characteristics of this autism spectrum disorder, and sharing her unique insight on life with these sometimes baffling, but always fascinating children and youths. Pp.206. Martian in the Playground by Clare Sainsdury. This book gives an account of what it is like to be a schoolchild with Asperger syndrome drawn from her own experience, as well as commenting about theories on the subject. 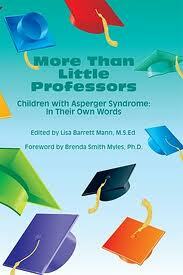 How to Be Yourself in a World That’s Different: An Asperger’s Syndrome Study Guide for Adolescents by Yuko Yoshida. This informative and encouraging text highlights the positive aspects of autism spectrum conditions, such as diligence, fairness, and a knack for unique ideas, but it also acknowledges the daily challenges faced by young people with AS and, crucially, offers strategies for dealing with these. Pp. 112. 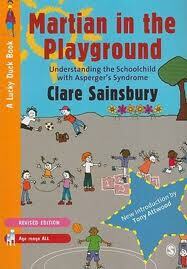 Build Your Own Life: A Self-Help Guide for Individuals With Asperger’s Syndrome by Wendy Lawson. The author, who has Asperger’s Syndrome herself, guides others on the autism spectrum through the confusing map of life, tackling the building bricks of social existence one by one. With insight and practical suggestions she looks at issues such as the concept of ‘self’ and ‘other,’ the difficulty of ‘putting on a face’ and how to deal with unwelcome changes, helping all those on the higher-functioning end of the autism spectrum, and those close to them, to get the best out of a world that is often perplexing. Pp. 176. Marching Out of Time by Quinn Koeneman. The author explores how he came to terms with his diagnosis and how he has integrated it into his identity. His reason for writing this book, he said, is to help others with the diagnosis find their own acceptance and understanding of who they are. Pp. 122.